It’s not obvious, but this illustration is about struggle. Around 11 years ago, I read an anecdote that stuck with me. It was about a man who witnessed a moth emerging from a cocoon. The moth was struggling to get out so the man very gently snipped the cocoon so that it could easily get free. But the moth’s body was swollen and its wings were small and shrivelled. Unable to fly, it flopped around and died a short time later. In attempting to help the moth, the man had actually caused it’s demise. Emerging from the cocoon on its own would have caused the moth’s body to become elongated and fluid would have been forced into its wings. The moth needed the struggle in order to live. I don’t know where the original story came from as I've seen several variations since then. 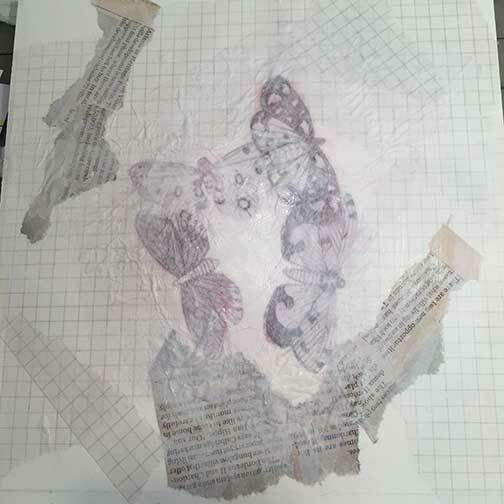 And I’m not even sure about the biological accuracy as my research uncovered that at least some kinds of butterflies inject fluid into their wings from their abdomens after emerging from their chrysalids. 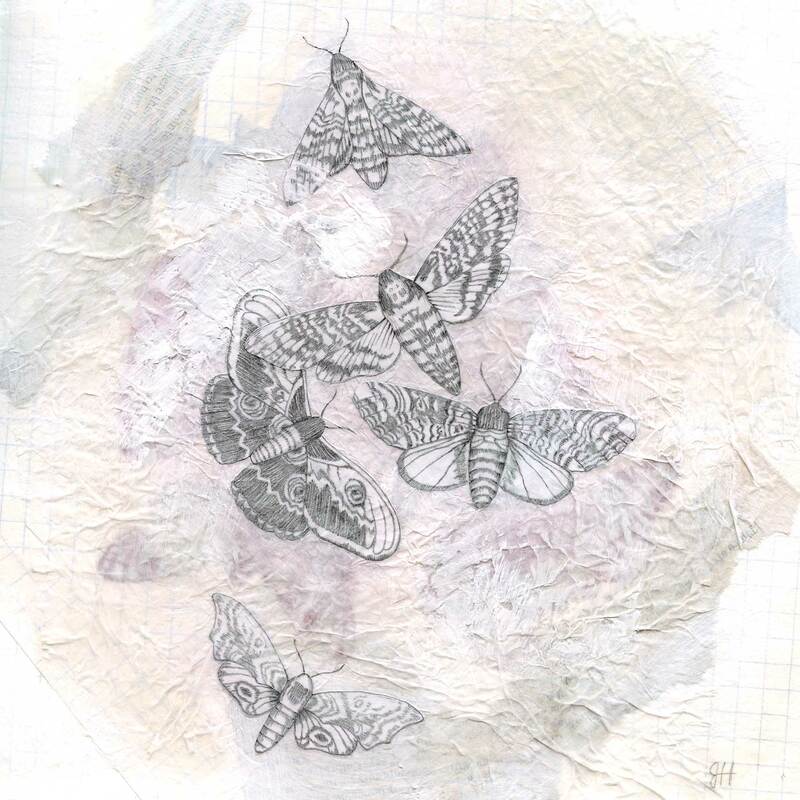 Nonetheless, since that time, I have really liked the idea of a moth as a metaphor for struggle. 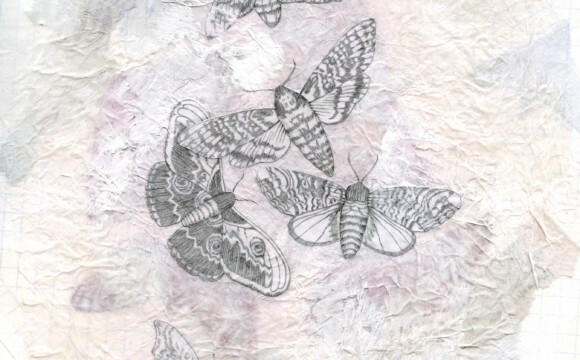 I had done some sketches of moths back then intending to do an image about struggle, but none of them ever felt right. Then I thought I would use it in an editorial illustration if I ever got an assignment about struggle, but I never did. The idea has been percolating in the back of my brain for a long time. In mid August, I witnessed a tiny worm trying to get out of its cocoon and I was reminded of the struggle of moths. I felt like the time had come to revisit the idea. The topic of struggle is one that has been on my mind a lot this past year. At the beginning of the year, my spouse and I separated after 13 years together. I struggled at first to accept it, and then to let go. It was a struggle to find my footing and navigate being on my own again after having been someone’s partner for so long. To adapt to not having another adult to talk to at the end of the day. To forgive, to be fair, to not lose sight of my values. It has been, and continues to be, a struggle to learn how to be a single parent and to balance that with having a career of my own, and a life of my own. There have been creative struggles too; navigating the ups and downs of pouring your heart and soul into a project and adapting to setbacks and disappointments. However, without struggle there is no growth. I do believe that I have grown a lot as a person this year and I am definitely stronger than I thought I was. Hopefully, like the moth, I’m now better equipped to handle whatever comes next. 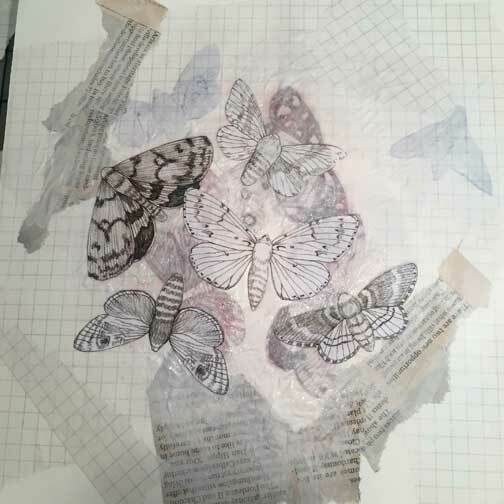 In August, I just started drawing moths. I had no idea what I was going to do with them, but I thought I would just sketch until something started to come together. 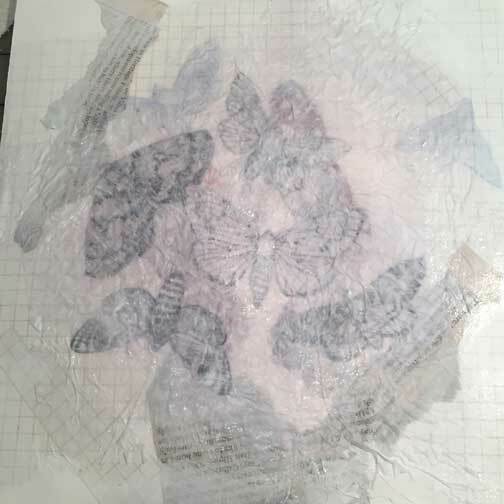 I didn’t want to be literal by drawing a moth struggling to emerge from an actual cocoon, but came to like the idea of using tissue paper and layers of transparent paint to represent the idea of the cocoon. I don’t normally like drawing realistically so this a stylistic departure for me, but I found the act of rendering the patterns in their wings to be meditative and comforting. Even cathartic – which I think plays into the concept. I also really enjoyed the process of building up the layers in this painting. I also took photos of the painting process as I added each layer. 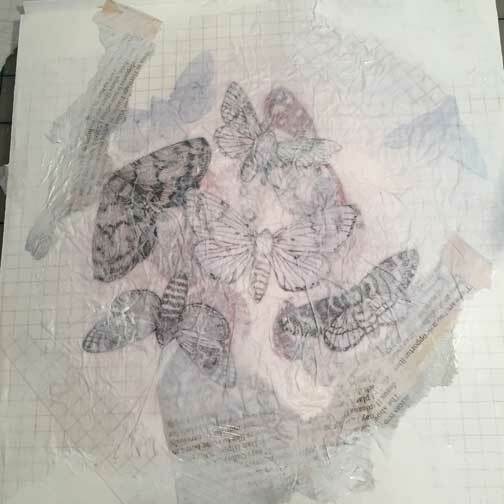 I wish a few of the moths were a bit more visible in the end, but maybe the fact that some of them are completely buried under there says something about struggle too.